Heavy fighting raged in Liberia's besieged capital Wednesday despite rebel declarations of a cease-fire, with President Charles Taylor's troops battling rebels trying to advance on his downtown stronghold. Mortar shells crashed into neighborhoods of tin-roof shacks overnight, killing at least one person and wounding eight adults and a dozen children on the government-controlled side of the capital, aid workers said. Taylor's forces fired volleys of rocket-propelled grenades at the rebel-held port area. "There is nothing like a cease-fire here," said Kate Wright, a downtown resident who spent a sleepless night cowering in a basement-level business center with neighbors. Other people slept on city beaches, feeling safer in the soft sand than in their own homes. Stray bullets from fighting near two bridges hit far into the capital, pinging into the neighborhood around the U.S. Embassy and scattering a crowd gathered there to draw water from a stream. Taylor's military chief, Gen. Benjamin Yeaten, said rebels were attempting to cross the bridges into central Monrovia despite a pledge late Tuesday to stop fighting and pull back to the port to await the arrival of a long-awaited international peace force. "The fighting is still heavy here," Yeaten said from his headquarters overlooking the bridges. "We are in a fierce exchange of fire with enemy forces." Rebel leaders could not be reached for comment. Under pressure from the Bush administration, which has been insisting the Taylor leave, the rebel group announced a new cease-fire late Tuesday. It was the latest of a series of truce declarations in recent weeks that have been repeatedly flouted by fighters on both sides. 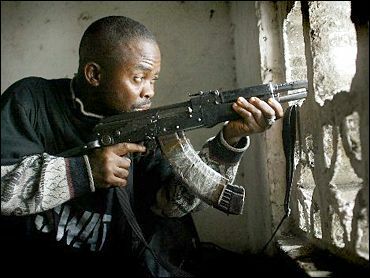 Insurgents have fought a 3-year-old war to capture Monrovia and topple Taylor, a U.S.-educated business student and Libyan-trained guerrilla fighter whose own uprising in 1989 launched Liberia into 14 years of near-perpetual conflict. The main, northern-based rebel group has made three pushes into Liberia's capital, a city of 1 million people overflowing with hundreds of thousands of refugees. Its troops are holding Monrovia's port, cutting off food and other vital aid for the hungry, disease-ridden city. On Monday, a second, smaller rebel group abandoned its own cease-fire pledge and went on the attack, capturing Liberia's southeastern port of Buchanan and severing what aid workers say was Monrovia's last aid lifeline. Government forces launched a counterattack Tuesday, leaving neither side in control overnight as fighting flared in the streets of Buchanan. Taylor's military officers also reported themselves in heavy fighting for the president's former stronghold of Gbarnga, 110 miles north of Monrovia, which was taken by the main rebel group late Sunday. Information Minister Reginald Goodrich said fighting continued Wednesday in both places. "It's just a matter of time before we dislodge them," he said of the insurgents. Goodrich dismissed the rebels' truce announcement. "This whole thing about pulling back to the port is so hypocritical. They are already in the port and every time they try to come out, we push them back," he said. In its latest truce pledge, the rebel group Liberians United for Reconciliation and Democracy pledged to stop combat immediately and turn over Monrovia's port to peacekeepers as soon as they arrive. Arguments over financing are believed to be delaying deployment of the peace mission promised by other West African nations, with assurances of U.S. and other international assistance. Nigeria, West Africa's military power, has offered two army battalions but says it needs help with what it expects to be a multimillion-dollar daily tab. U.N. Secretary-General Kofi Annan offered Tuesday to provide transportation for one Nigerian battalion and spelled out plans to quickly bring in reinforcements. In a letter to the U.N. Security Council, Annan expressed deep concern "at the dramatic deterioration of the situation on the ground" and the delay in starting the deployment of a 1,500-soldier West African force that has been promised since last month. The U.S. assistant secretary of state for Africa, Walter Kansteiner, arrived in Guinea, Liberia's northern neighbor, on Wednesday for talks with Guinea officials. Kansteiner, who was joined by other U.S. government and military advisers, met with Guinea's minister of foreign affairs, Francois Fall, and was scheduled to meet with Prime Minister Lamine Sidime, Guinean officials said. Guinea's government, which accuses Taylor of being behind cross-border raids, is widely alleged to be a leading backer of Liberia's main rebel group. It denies the allegation. Another round of regional talks is set for Thursday in Accra, Ghana. This one is for top West African leaders, authorities said.